Candidates for Sainthood and other Sinners/ Aprendices de santo y otros pecadores. This collection of poems explores the thin line between saint and sinner. The poet asks the reader to consider, “Who is the saint here? Who is the sinner?” A few well-known people appear in poems as well as a few genuine saints, but mostly the poems explore the saints and sinners and everyday folks that we meet each day on the sidewalk, at work, the mall or on TV. The author collaborated with Mexican poet Fernando de la Cruz in recasting the poems in Spanish. 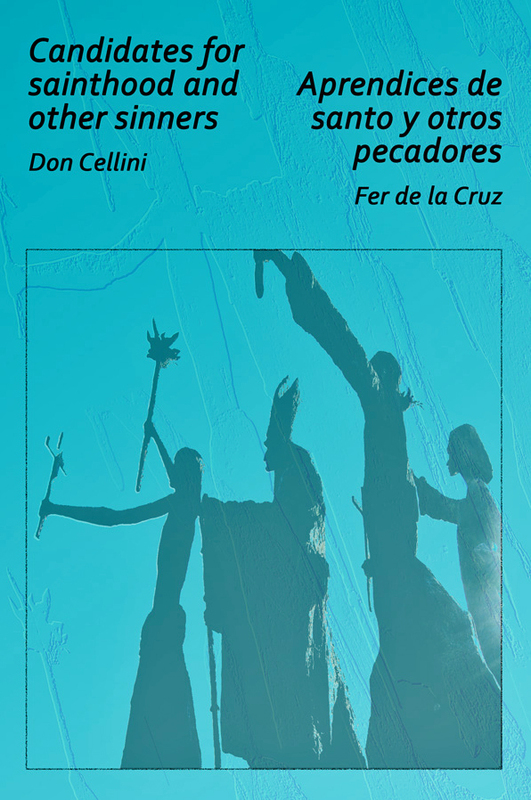 With Cellini’s originals in English and in Spanish, de la Cruz created a third version. Sometimes these are faithful translations, but often they soar off the page and take on an identity of their own. The poems are lean but, with a few pen strokes, Cellini creates sketches which suggest more than he writes. Impressions. Moments in time. Bits of humor. And de la Cruz has captured these same images in exquisite Spanish originals. The work as a whole, then, is a collaboration which will please readers of English, readers of Spanish, and bilingual readers will have a double delight. en la parada de autobús. o a los que esperan con él. Fernando de la Cruz Herrera (Yucatán, México, 1971) holds an MA in Spanish from Ohio University and a BA in Philosophy. As an independent editor, writer, and cultural promoter, he has participated in cultural festivals, conferences, and book fairs in Mexico, Cuba, France, and the United States. His books include Redentora la voz (Ayuntamiento de Mérida, 2010), Aliteletras. De la a a la que quiera (Dante, 2011), Sabotaje a la che y otros poemas de martitologio (forthcoming from Instituto de Cultura de Yucatán) and the chapbook Seven Songs of Silent, Singing Fireflies (JKPublishing, 2008). He has received two national, one regional, and one state-wide poetry awards in Mexico. His main passions are poetry (which he often finds in theatre, music, film…), language teaching made fun, and the constant discovery of the flavors, shapes, and depths of human life / delacrux@hotmail.com. Fer has won 1st prize in the Premio Regional de Poesia Jose Diaz Bolio, 2011, sponsored by Patronato Pro Historia Peninsular, $10,000 pesos, his second time. The first was in 2003 and 2nd place in the Premio Estatal de Literatura Infantil Elvia Rodriguez Cirerol, 2011, sponsored by Instituto de Cultura de Yucatan, $5,000 pesos. Don Cellini is a poet, translator and photographer. He is the author of Approximations/ Aproximaciones (2005) and Inkblots (2008) both collections of bilingual poems published by March Street Press. His book of prose poems, Translate into English was released in 2010 by Mayapple Press. He has published translations of three Mexican poets: Elías Nandino: Selected Poems (2010 McFarland Publishers); Imagenes para una anunciación / Images for an annunciation, the work of poet Roxana Elvridge-Thomas (FootHills Press, 2012), and Desire I remember but love, no / No recuerdo el amor sino el deseo, by Sergio Téllez Pon (2013 by Floricanto Press). He is a recipient of fellowships from the King Juan Carlos Foundation and the National Endowment for the Humanities. He is professor emeritus at Adrian College in Michigan. View more of his work at: www.doncellini.com .